Lamont and Susan are both right. 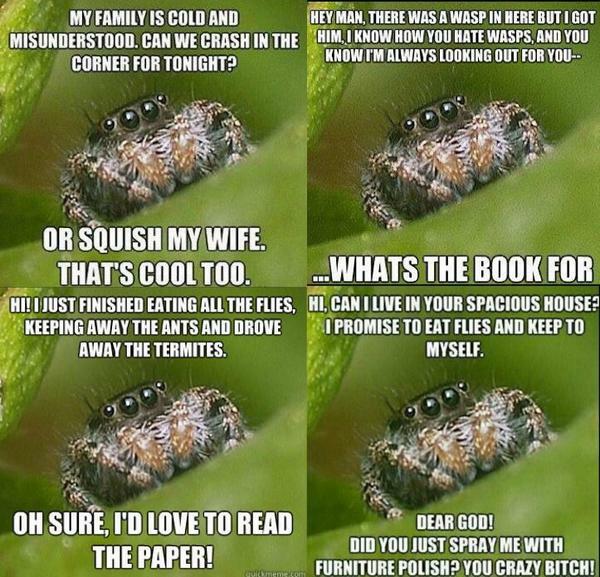 I never kill spiders, although I do brush away cobwebs when they become too conspicuous. I wouldn’t kill a non-poisonous snake, either. I don’t know Vladimir Putin’s intentions in Ukraine, but I don’t see anything that threatens the United States or is worth risking war over. Ukraine held elections Sunday which evidently were won by anti-Russian, pro-European parties. But the pro-Russian separatists in Donetsk and Lugansk districts did not take part, and will hold their own elections this coming Sunday. The government in Kiev objects to the Donetsk-Lugansk vote, but spokesmen for the Russian government say they’ll honor its results. A smart Ukrainian-American friend of mine said Putin’s policy to Ukraine is the same as Hitler’s policy toward Czechoslovakia. Hitler’s demand was to annex the Sudetenland border region, where Germans were in the majority. But Hitler went on to annex the whole of the country and then to attack Poland, launching the Second World War. In the same way, he said, Putin’s aim is to first annex Donetsk and Lugansk, then take over the whole of Ukraine and then move against Poland and the Baltic states. Another friend, who speaks Russian and watches Russian television, agrees with this assessment. She said Putin is an extreme Russian nationalist and imperialist. Russians despise other nationalities, and especially look down on Americans as naive and weak, she said; it is important to stop Russia in Ukraine and nip Putin’s ambitions in the bud. 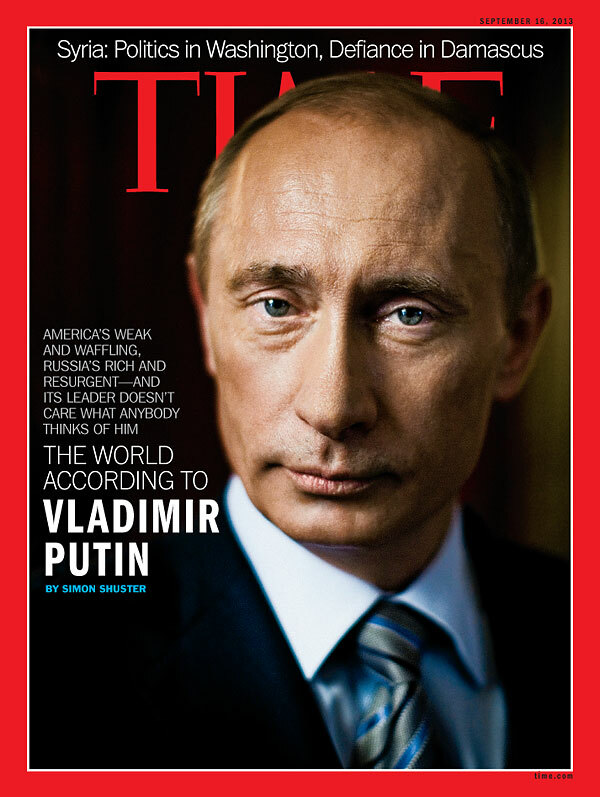 My impression of Vladimir Putin is that he is a tough and ruthless, but realistic. He may lie, but he doesn’t deceive himself. As a Russian nationalist, he no doubt regards himself as the protector of Russians wherever they are, including Russians in Ukraine and northern Kazakhstan. Putin is trying to organize something called the Eurasian Union, an economic bloc consisting of the republics of the former Soviet Union, as a rival to the European Union. No doubt, like all Russian statesmen before him, he thinks it essential that Russia have access to the Baltic and Black seas. I don’t see anything in this that threatens the interests of the United States or the European Union, and certainly not anything worth risking war over. Can we do without nuclear power? A lot of smart people think it is possible to eliminate or drastically reduce the use of fossil fuels while also eliminating nuclear power. Maybe they’re right, but I don’t see it. Presently New York’s electrical generating capacity is about one-third coal and oil, one-third natural gas, one-sixth nuclear power and most of the rest hydroelectric power. Only about 3 percent is wind energy, and there is tiny plant powered by biomass. The burning of coal and oil, especially coal, creates greenhouse gasses, so ideally we’d eliminate coal and minimize oil. Natural gas, in contrast, burns cleanly, which is why it is promoted as a “transition” fuel. But unburned natural gas (methane) is one of the worst greenhouse gasses, and fracking releases methane into the atmosphere. Fracked natural gas doesn’t help the climate, but, without fracking, natural gas would be scarce and expensive. All the good hydroelectric sites in New York are already used, so there’s little potential to increase hydro. So you would have to step up production of wind energy by a factor of 25 or more. I don’t see how it is possible do do without nuclear power and still maintain a dependable electricity supply. I think nuclear power is a dangerous technology which nevertheless can be operated safely, provided the industry uses the best practices and the best technology. This would mean phasing out existing U.S. nuclear power plants, most of which are past their scheduled decommissioning dates and some of which are located on earthquake fault zones, and building a new generation of nuclear power plants using the newest and best technology. I will change my mind about this if Germany is able to stick to its moratorium on nuclear power without increasing its use of coal-fired and oil-fired power. 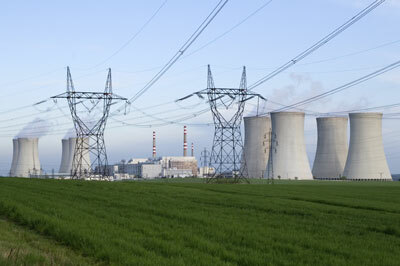 But as I see it, nuclear and coal are the only alternatives for increasing electric power generation. The United States happens to have ample supplies of coal at current rates of use, as does China, but coal is the worst fuel in terms of effects on human health, the environment and climate change. Maybe someday the USA and China can invent a way to burn coal cleanly, but otherwise I see no alternative to nuclear. Can Europe keep the lights on this winter? by Mark Gilbert for Bloomberg View. [added 10/30/14]. Another example of the problem of trying to do without both fossil fuels and nuclear power. Millions of people in the USA and other industrial countries are living paycheck to paycheck. There are millions more for whom being able to live paycheck to paycheck would be a considerable improvement. The people in this second group, “the precariat,” don’t know from week to week whether they’ll be able to work or how much they’ll earn. From the perspective of the elite, that means a “flexible” labor force, which from their perspective is a good thing. But the flexibility is all on the part of workers, not of managers or holders of financial assets. Prof. Guy Standing of the University of London said the precariat class is growing in all industrial countries. This class consists of three categories of people—sons and daughters of blue collar workers who had secure jobs, migrants and minorities who live on the fringe of society, and college graduates who find themselves unable to work in their fields. Few of them participate in politics because they’re too busy just scrambling to make a living. They’re divided among themselves, with the children of the middle class sometimes blaming minorities and migrants for their plight. But they’re discontented, and while their discontent mostly takes the form of violent protest, Standing thinks that, under the leadership of the educated part of the precariat, they could become a powerful force. The militarization of the police, the spread of universal surveillance and the criminalization of dissent indicate that a lot of people in authority think the same thing. 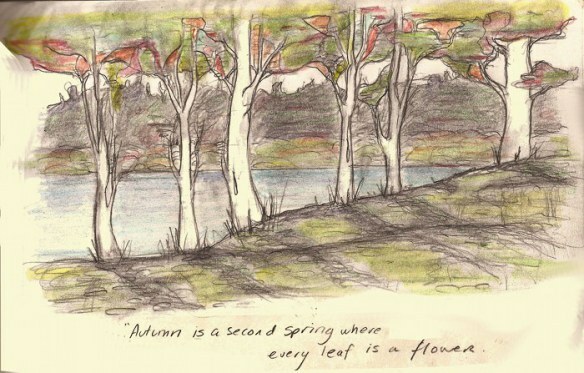 These photos from Bored Panda show the beauty of the transformation from summer into fall. This Moyers & Company broadcast was aired about a year ago. Naomi Klein’s THIS CHANGES EVERYTHING: Capitalism vs The Climate has convinced me that, in order to maintain a habitable planet, it’s necessary to limit and maybe eliminate the burning of coal, oil and gas, and that energy companies will never do this unless they are forced to do so. What I’m not convinced of is that it is possible to painlessly transition to some green utopia, in which everybody’s material standard of living is the same as it is now, except for a small group of plutocrats. My house is heated with natural gas, and my gas bills lately have been low, due to an abundance of gas supplied by hydraulic fracturing (of which I disapprove). My car runs on gasoline, and the computer on which I write this post is powered by electricity. Over the years I’ve read books by Lester R. Brown, George Monbiot , and Al Gore making the case that with smart technology, I can heat my house with solar energy and better insulation, I can ride a streetcar that is almost as convenient as a private automobile, and that electricity can be provided by windmills, solar panels, other innovative sources of energy and a smart electrical grid that eliminates waste in the system. I don’t have the knowledge to question their proposals on technical grounds. I agree with Arthur C. Clarke—that the only way to test the limits of the possible is to venture a little way into the impossible. And the alternative to trying is to accept the “long emergency” foretold by James Howard Kunstler. But even at best, the transition will cost enormous sums of money. Who would pay? Naomi Klein says that rich people in rich countries should pay, especially countries that enjoy a high level of consumption based on fossil fuels. This means first and foremost the USA. This video by Richard D. Wolff is a clear and accurate account of the financial crash and the current struggles of American working people. It dates from 2011, but it is still relevant. I recommend fast-forwarding through the first three and a half minutes minutes, which are about economic classes, and getting to the meat of the video, which is about the foreclosure and credit crisis. I can remember when most goods and services were paid for through cash and check, without having to go through credit card companies, other lends and insurance companies. I don’t deny the benefit of credit or of insurance, or advocate going without either, but it is striking how much we Americans are at the mercy of lenders and insurers. I never knew that the art of blogging was taught in college. Humor in the face of danger. 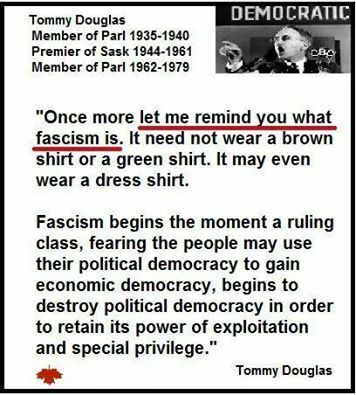 Tommy Douglas, as virtually all Canadians know, was the father of Medicare in Canada, which was first introduced in Saskatchewan and then rolled out into Canada as a whole. Canadian Medicare inspired U.S. Medicare, but it covers almost all Canadians while the U.S. plan only covers the 65 and older population. Douglas was a champion of civil liberties. As a member of Parliament, he had the courage in 1970 to refuse to support the War Measures Act, which, in response to terrorist activity in Quebec, expanded police and military powers and curtailed civil liberties throughout Canada. In 2004, Douglas was voted the greatest Canadian in a nationally televised CBC contest. The fight against global warming consists of many local struggles that, at first glance, don’t have anything to do with climate change. These struggles include resistance to hydraulic fracturing for natural gas, to the Alberta tar sands industry and the Keystone XL pipeline, to deep ocean oil drilling and to other destructive practices by oil, gas and coal companies. Such destructive practices are necessary to keep the fossil fuel companies in business because all the easy-to-get oil, gas and coal has been used up. And greenhouse gas emissions will decrease only when oil and gas drilling and coal mining decrease. Naomi Klein in her book, THIS CHANGES EVERYTHING: Capitalism vs The Climate, reported on how these scattered local resistance movements are coming to realize they are part of a common cause. In just one chapter, she touched on protests in Greece, Rumania, Canada’s New Brunswick, England’s Sussex, Inner Mongolia, Australia, Texas, France, Ecuador, Nigeria, West Virginia, South Dakota, North America’s Pacific Northwest and Quebec—all related directly or indirectly to stopping fossil fuel operations that would produce greenhouse gasses. She and others call this alliance “Blockadia”. Unlike some of the big, established environmental organizations, the grass-roots protesters do not limit themselves to lawsuits and political lobbying. They engage in nonviolent direct action, the kind of mass defiance that Gene Sharp advocated. These movements, more than the lobbying and lawsuits of the Big Green environmental organizations, will determine the future climate, she wrote. Here are links, with transcripts, to the complete Sept. 18, 2014 interview. Naomi Klein on the Need for a New Economic Model to Address Ecological Crisis. Naomi Klein on the People’s Climate March and the Global Grassroots Movement Fighting Fossil Fuels. 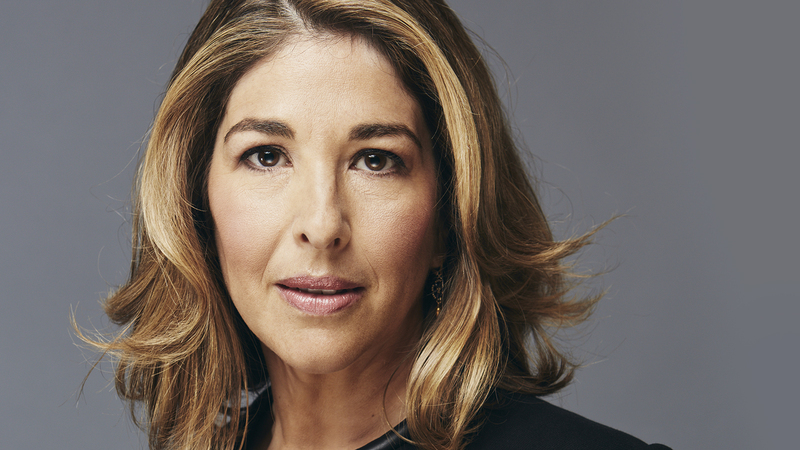 Naomi Klein on Motherhood, Geoengineering, Climate Debt and the Fossil Fuel Divestment Movement. Naomi Klein thinks that, if governments had taken action in the 1990s to curb greenhouse gas emissions to control climate change, it could have been accomplished without drastic upheavals in society or in people’s lives.. Unfortunately another movement arose at the same time, a movement to remove restrictions on corporate activity, and this movement has proved more powerful than the climate movement. The corporate movement has produced privatization, deregulation, repeal of anti-trust laws and a strong and enforceable body of international law to block environmental regulation and subsidies of renewal energy. The first chapter of Klein’s new book, THIS CHANGES EVERYTHING: Capitalism vs the Climate, is about how the real objection of climate change deniers is their realization that climate change, if real, would mean an end to free enterprise as they know it. She said they’re right. Our economy is based on what Klein calls extractivism—the idea that there can be unlimited economic growth based on the burning of a limited amount of coal, oil and gas. This is a process that will someday end in and of itself, when it is no longer feasible to dig out what little fossil fuels remain. We the people can’t afford to wait until that happens, because emissions from burning fossil fuels will have heated up the planet to the point where it is barely liveable. But moving away from extractivism is easier said than done. An end to extractivism would require, first of all, the repeal of international trade treaties such as NAFTA and the World Trade Organization treaty that allow corporations to challenge national laws that favor local industry or interfere with the international movement of goods and services. We know that we are trapped within an economic system that has it backwards; it behaves as if there is no end to what is actually finite (clean water, fossil fuels and the atmospheric space to absorb their emissions) while insisting there are strict and immovable limits to what is actually quite flexible: the financial resources that human institutions manufacture, and that, if imagined differently, could build the kind of caring society that we need. 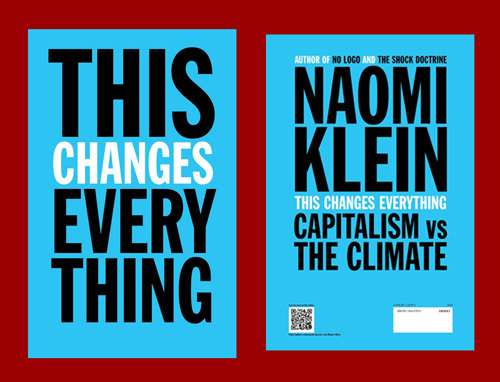 Naomi Klein’s brilliant new book, THIS CHANGES EVERYTHING: Capitalism vs the Climate, underlines two important things I had not quite realized. The first is that the built-in financial incentives of the fossil fuel corporations, or capitalism generally, make it impossible for corporate executives to do anything on their own that would limit the greenhouse gasses that cause climate change. The second is that many seemingly unrelated struggles against abuses by fossil fuel companies, or abuses by corporations generally, tie in with fighting climate change. When native Americans fight to have Indian treaties recognized in law, when small towns in upstate New York pass ordinances against hydraulic fracturing for natural gas, when ranchers and Indians protest the Keystone XL pipeline, when other protestors object to corporate trade treaties such as NAFTA, when Occupy Wall Street protesters advocate economic democracy—all these things help other people in danger from the increase in droughts, floods and violent storms. I confess that I did not see these connections, or did not fully realize their significance, until I read this book. 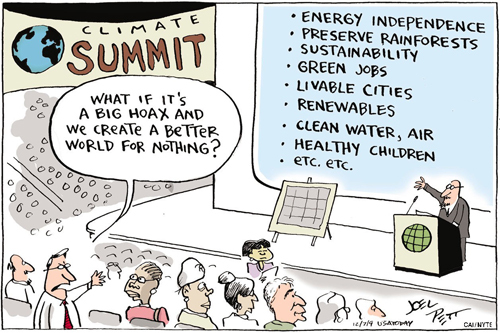 I had thought of the question of climate change as primarily a question of how and how much I and other people are willing to reduce their material standard of living, or give up hope of increasing their material standard of living, so that future generations will have a decent planet to live on. This is a real and important question, but it is not the only question. As Naomi Klein points out, the well-being livelihoods of many people are threatened by continuing on the present course. That is because the era of easily-available oil, gas and coal is long gone, and the methods of extracting them—deep water ocean drilling, tar sands, fracking, mountaintop removal—are increasingly costly, dangerous and destructive. The Iraqi army is retreating, often without firing a shot, from the forces of the Islamic State (ISIS), which they vastly outnumber. This comes after a decade in which the U.S. government spent $25 billion to train and equip the Iraqi troops. 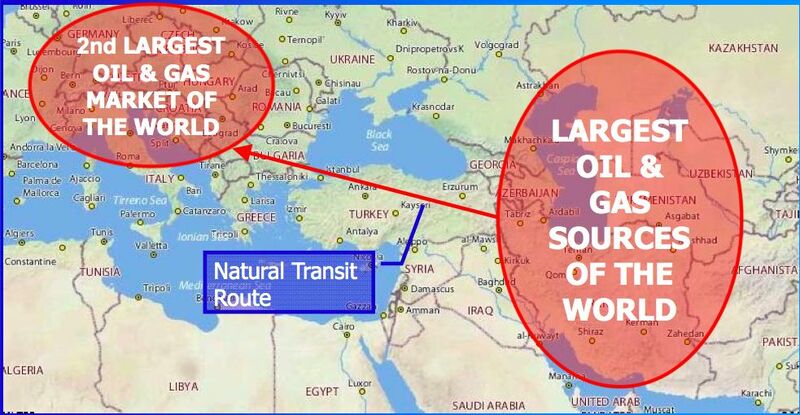 It is not necessary to know a lot about the Middle East to understand why. Troops won’t put their lives in danger for someone to whom they feel no loyalty. They will feel no loyalty to a government that is completely corrupt. Any government that is set up to serve the interests of a foreign power (the USA) is almost inherently corrupt. These are not problems that could have been solved by keeping a token American force in Iraq for a few years longer. They might possibly have been solved if the existing Iraqi army had not been dissolved right after the U.S.-led invasion. Investing in Junk Armies: Why American Efforts to Create Foreign Armies Fail by William J. Astore for TomDispatch (via The Unz Review). Highly recommended. The Iraqi Army That Never Was by Kelly Vlahos for The American Conservative. 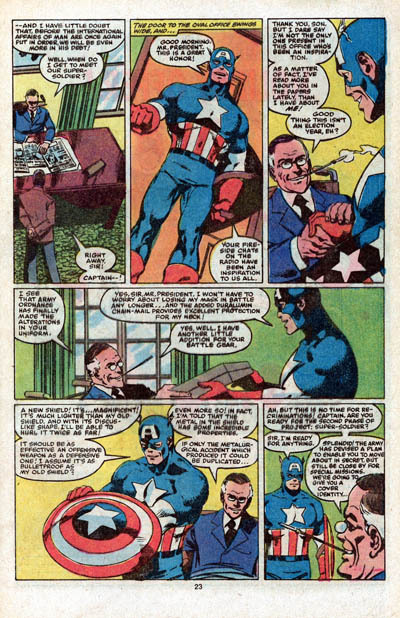 Steve Rogers doesn’t represent a genericized America but rather a very specific time and place – 1930’s New York City. We know he was born July 4, 1920 (not kidding about the 4th of July) to a working-class family of Irish Catholic immigrants who lived in New York’s Lower East Side. This biographical detail has political meaning: given the era he was born in and his class and religious/ethnic background, there is no way in hell Steve Rogers didn’t grow up as a Democrat, and a New Deal Democrat at that, complete with a picture of FDR on the wall. Steve Rogers grew up poor in the Great Depression, the son of a single mother who insisted he stayed in school despite the trend of the time. His father died when he was a child; in some versions, his father is a brave WWI veteran, in others an alcoholic, either or both of which would be appropriate given what happened to WWI veterans in the Great Depression, and then [he was] orphaned in his late teens when his mother died of TB. And he came of age in New York City at a time when the New Deal was in full swing, Fiorello LaGuardia was mayor, the American Labor Party was a major force in city politics, labor unions were on the move, the Abraham Lincoln Brigade was organizing to fight fascism in Spain in the name of the Popular Front, and a militant anti-racist movement was growing that equated segregation at home with Nazism abroad that will eventually feed into the “Double V” campaign. 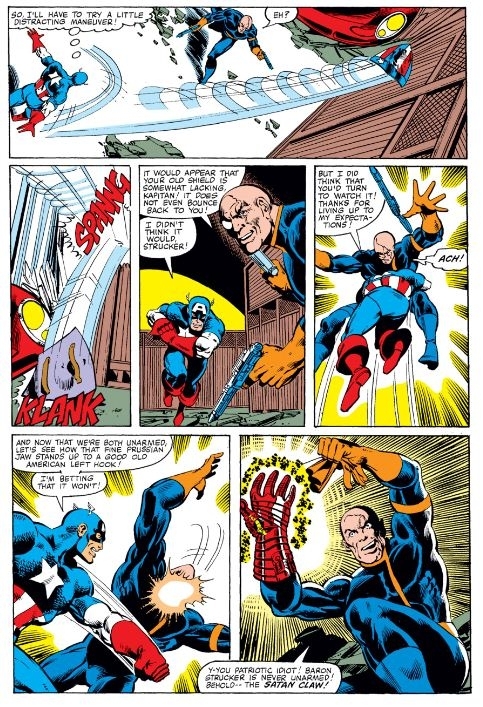 And this Steve Rogers, who’s been exposed to all of what New York City has to offer, becomes an explicit anti-fascist. In the fall of 1940, over a year before Pearl Harbor, he first volunteers to join the army to fight the Nazis specifically. 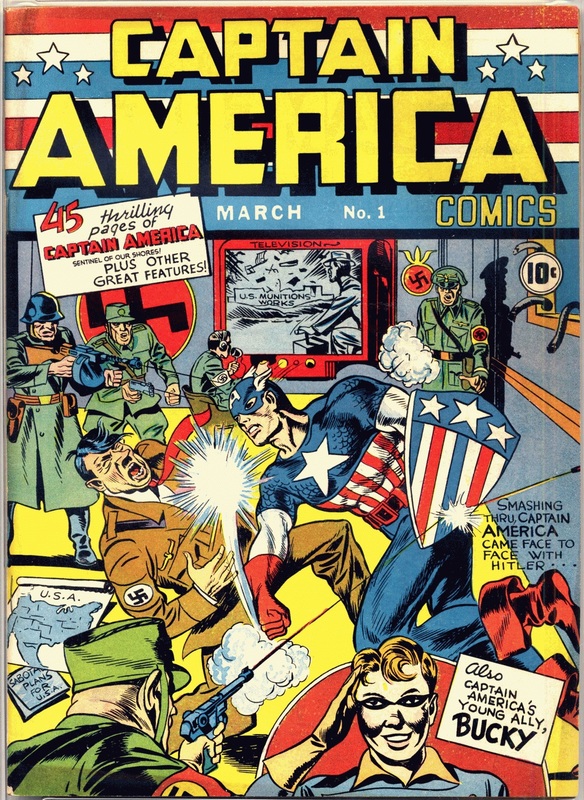 This isn’t an apolitical patriotism forged out of a sense that the U.S has been attacked; rather, Steve Rogers had come to believe that Nazism posed an existential threat to the America he believed in. 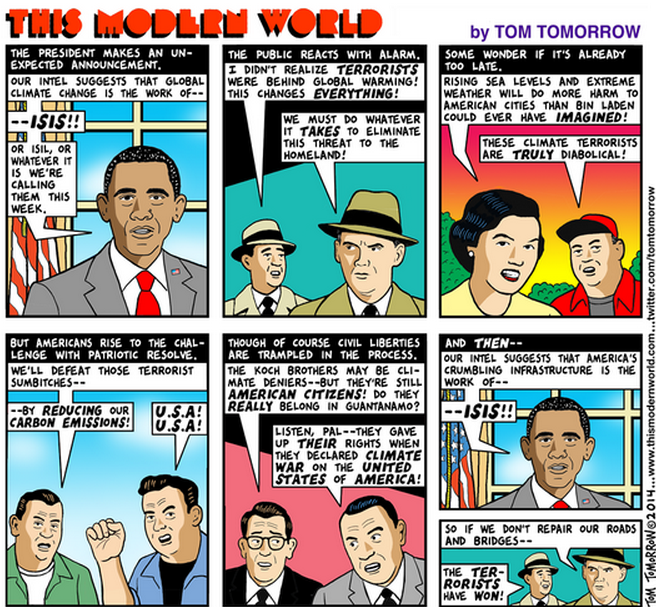 New Deal America. Dependence of key European nations on imports of Russian oil and gas puts the European Union in weak position in relation to Vladimir Putin. One way to get out of that position of weakness is to end the sanctions against Iran, and import Iranian oil and gas. In the longer run, Europe would benefit from a new gas pipeline from Iran to Europe. The European Union has no conflict of interests with Iran. 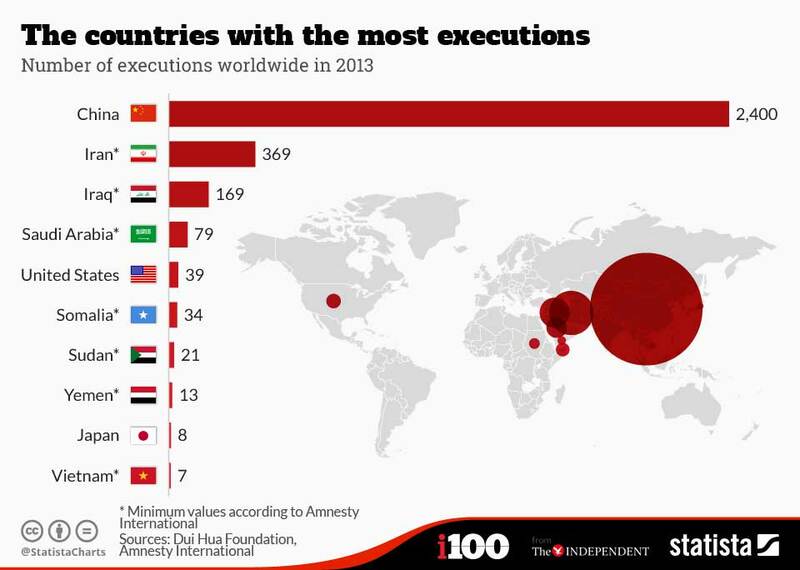 It is following the lead of the United States. As far as that goes, the United States has no conflict of interests with Iran. We Americans are merely nursing old resentments and following the lead of Israel and Saudi Arabia. Breaking Europe’s Putin addiction by Amir Handjani for Al Jazeera. Number of American journalists, correspondents and broadcast news analysts. Number of Americans with security clearances. 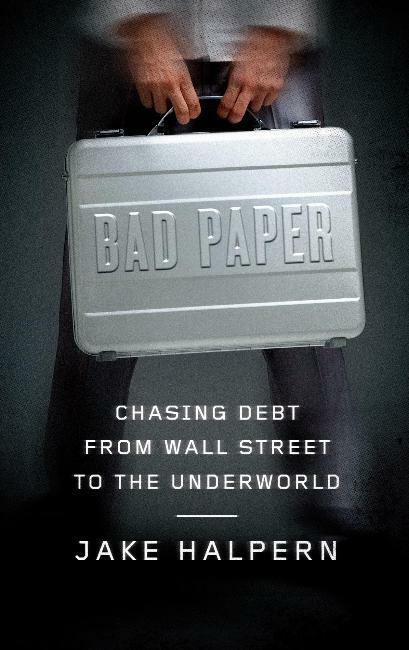 Jake Halpern wrote a New Yorker article, and then a book, Bad Paper (which I haven’t read), about the debt collection industry. He was interviewed by Bloomberg’s Megan McArdle. My mom was getting hounded by a debt collector for a bill that she did not owe. She eventually paid it just to get him to stop harassing her. I started investigating and found out that much debt-collection activities were in my hometown of Buffalo, New York. I ended up writing a profile on a Buffalo-based debt collector who bought and sold and collected on debt for pennies on the dollar; that story ran in the New Yorker. That New Yorker story got optioned by Brad Pitt’s production company. So I went back to Buffalo with the screenwriter. No one wanted to talk to a journalist back when I was doing the New Yorker piece, but now that I was with Brad Pitt, everyone talked. One night, the screenwriter and I go out to dinner with a banker and a former armed robber who had gone into business with one another. They tell me an incredible tale. They purchased $1.5 billion worth of bad debt for pennies on the dollar. Their aim was to make a fortune. All goes well on this unlikely venture until some of the debt is stolen and the former armed robber must delve into an underworld where debt is bought and sold on street corners. This quest ends in a showdown with guns in the inner city of Buffalo, New York. The world Halpern describes is lower on the economic food chain than the one described by Matt Taibbi in The Divide, but the process is basically the same. A lender decides it is not worth the effort to collect on certain bad debts, and sells the debt to a collection agency for pennies on the dollar. The problem is the lack of reliable information as to what is owed and for what. Sometimes the collectors don’t know how much is principal and how much is accrued interest. Sometimes unscrupulous lenders will sell the same debt to several collection agencies. Halpern said he wound up having more sympathy with debt collectors than he expected. It is one of the few occupations open to convicted felons. The central figure in his New Yorker article was a former cocaine dealer trying to go straight. What does he think needs to be changed about debt collection? My street and most of my neighborhood in Rochester, N.Y., is lined with trees. They are a pleasure to look at, whatever the season, although my favorite is fall. In the spring, they bud and blossom. 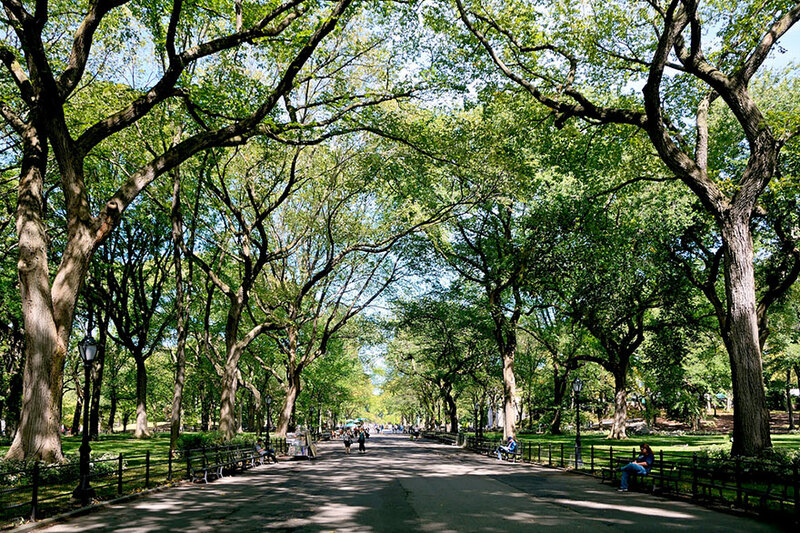 In the summer, they make a green canopy over the streets. In the fall, they change color. In the winter, they form a sparkling crystal lattice, or a stark black fractal pattern against the sky. These trees did not appear all by themselves. They did not plant themselves. 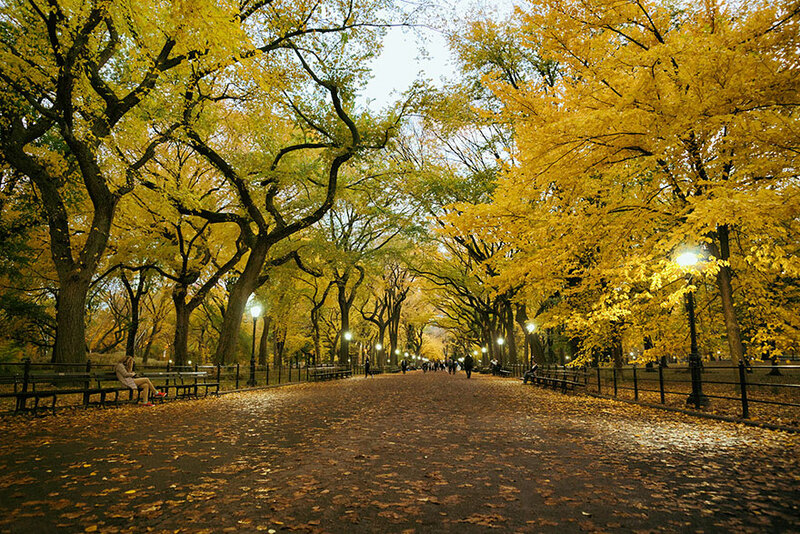 Somebody years ago took the trouble to plant the trees and create the beauty I now enjoy. So many of the good things in my life are due to the foresight and work of other people whose names I do not know. Could my coffee addiction be good for me? I started drinking coffee as a college student and, ever since then, I have been heavily addicted to caffeine. I would stay up late at night studying and working on the college newspaper, but, being young and foolish, I took pride in being caffeinated and being able to go without sleep. During my 40 years working on newspapers, I drank coffee throughout the day to stay alert. After a couple of hours at my desk, I began to get sleepy and sluggish if I couldn’t get a cup of coffee out of the vending machine. Having drunk all that coffee, I didn’t feel sleepy in the morning, and often stayed up until nearly midnight or beyond midnight. And then, of course, I needed more coffee in the morning to become fully alert. My nightmare of being shipwrecked or surviving an airplane crash in wilderness is that I would not be able to function without a cup of coffee. 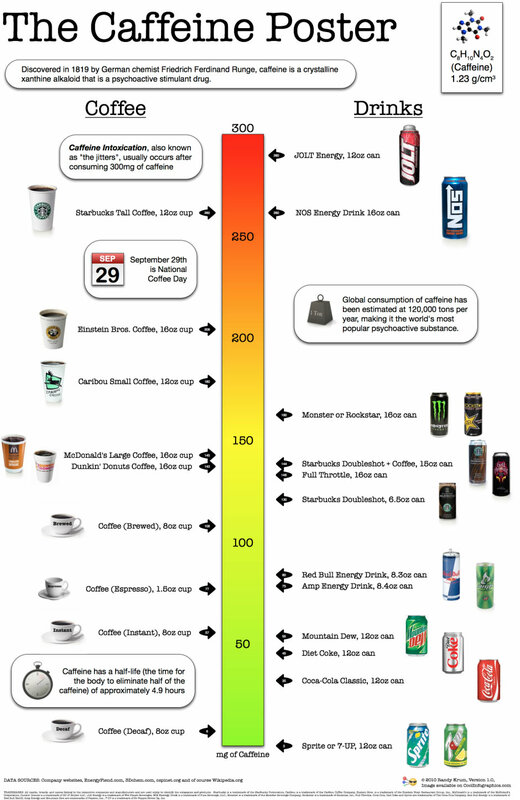 When I retired, one of my goals was to kick the caffeine habit. I cut back to one cup of coffee a day, but, without that one cup, I couldn’t function in the morning. Now I drink two or three cups a day. The other day I read an article about a study by a team at the Harvard School of Public Health that concluded that coffee is good for you, and that habitual coffee drinkers are a little bit more mentally alert than they would be otherwise. Furthermore there are genetic differences among people in their need and tolerance for coffee, and most people drink the amount of coffee that is good for them. Can this be right? Can something to which you are addicted be good for you? Drinking Coffee, For Your Health by Andrew Gambone for The Atlantic.